Update, 2:25 p.m.: The road is now open. Original story, Wednesday 11:30 a.m.: Sunrise Valley Drive will be shut down in both directions for most of Wednesday as crews fix a gas leak. A gas main was hit by a construction crew shortly before 11 a.m.
Traffic is blocked from Parkridge Boulevard to Hunter Mill Road. 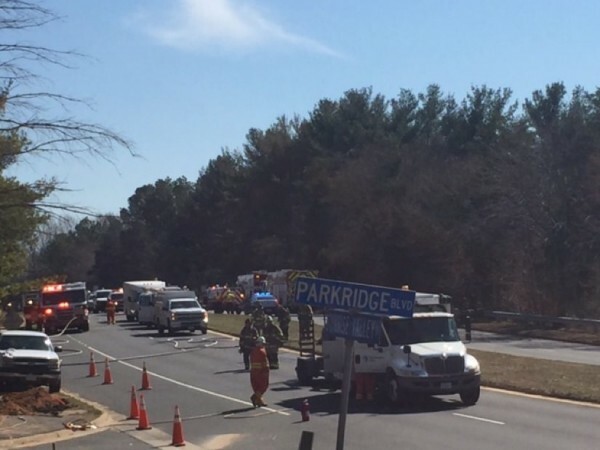 Fairfax County Police at the scene said it could be several hours before roads are reopened. Reston Now will check with Sunrise Valley Elementary School for information should it affect school pickup and buses this afternoon. Last week, there was a similar incident in Reston. Reston Parkway was shut down for hours, disrupting traffic on many nearby streets, due to a gas main break caused by a construction crew.